Lump in neck is an abnormal mass usually found in the form of small embossed swelling or lump in the neck region. These lumps may develop in individuals of all age groups and are usually painless, and may get tender if inflamed or infected. In most cases, these lumps remain undiscovered for years due to small size. As soon as a mass is discovered in any part of the neck, an appointment with the doctor should be arranged as early as possible, since it can be an indication of infection or malignant diseases. 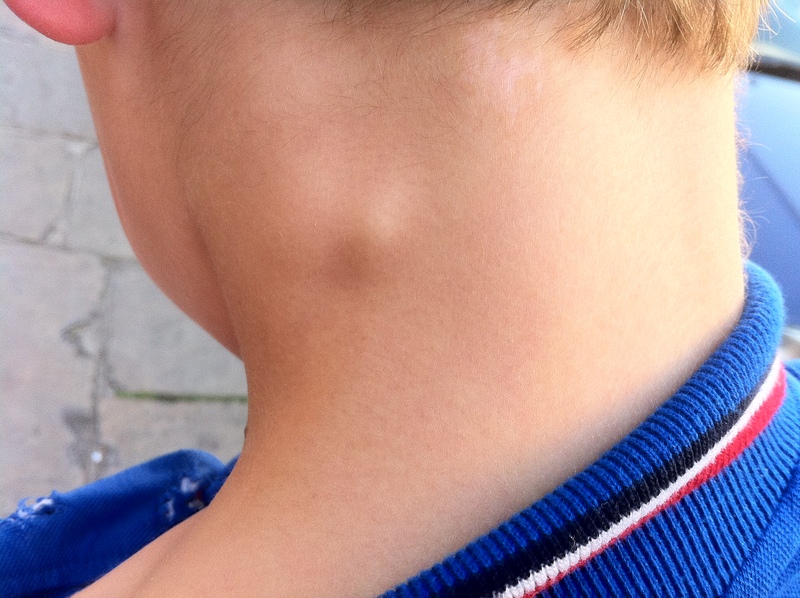 Not all neck lumps are caused by serious diseases, some may be caused by swollen lymph nodes or genetic reasons. If you are a smoker or alcoholic, or have a positive family history of cancer, seek immediate consultation to reduce the risk of serious problems. Strep throat: Strep throat is caused by streptococcal bacteria, which is mainly responsible for causing moderate illness in children. The bacterial agent may spread from person-to-person by physical/respiratory contact. Common symptoms are headache, high-grade fever and swelling of the throat and neck. Cat scratch disease: This is contracted from the scratch of a cat onto the exposed parts of the skin, such as broken skin. This leads to the formation of a small papule around infected areas or lymphadenopathy (or swelling of lymph nodes) that may present as neck lumps. Others: Other diseases such as tonsillitis, tuberculosis and bacterial pharyngitis can also have symptom of neck lump. AIDS: Acquired immune deficiency syndrome can lead to a compromised immune system, which may present as flu-like symptoms, rashes, fever and lymph node swelling. In some cases, multiple swollen regions are also observed in patients. HIV disease: This disease is caused by HIV or human immunodeficiency virus. Symptoms commonly include high-grade fever, malaise, body pain and swollen lymph nodes. Lymph node swelling is more pronounced in the later stages of infection. Others: Other viral diseases resulting in neck lumps due to lymph node swelling include viral pharyngitis, rubella and herpes virus. Hodgkin’s lymphoma: The malignancy of lymph node is referred to as Hodgkin’s lymphoma and is marked by repetitive division of lymphocytes. These lymph nodes are found in the neck, liver, spleen and bone marrow. Leukemia: Malignant transformation of white blood cells can lead to the formation of aggregates all over the body (including neck), causing swelling and masses. Besides what have been listed above, lymph node swelling is also caused by allergic reactions (elicited by exposure to certain drugs, foods or antigens such as pollen grains). Hypersensitivity reaction may lead to generalized swelling or regional swelling. For example, people with peanut allergy may develop swollen lips, eyes, lungs, neck and throat lumps after exposure to peanuts. Swellings are often reported in the neck region with ongoing inflammation processes involving the salivary glands. Salivary glands can swell because of cancer or microbial activity. In certain cases, lumps are formed under the skin because of cysts such as sebaceous cysts. Mumps: Mumps are viral illnesses that are reported very frequently in children. Mumps are characterized by fever, muscle pain, swelling of the salivary glands and skin below the ears, etc. Salivary gland tumors: Malignant transformation of one or more salivary glands can also lead to neck lumps that may extend behind the ear and down the jaw and the neck. These tumors are reported in the setting of liver cirrhosis, salivary gland infections or Sjogren's syndrome, etc. Salivary gland stones: These are reported due to excess mineral deposition or accumulation in the gland substance. These stones may obstruct the salivary flow by blocking the ducts and can lead to swelling of the entire neck region. This swelling is likely to spread to regions like lower throat, ears and jaws. Thyroid glands are butterfly shaped glands that are found behind the windpipe. Swelling in this area can also lead to lump in neck. Goiter: It is the swelling of the thyroid region due to either low thyroid production or toxic contamination in high thyroid production. Low thyroid production can be accounted to low iodine levels, and high levels thyroid are produced because of cigarette smoking, alcoholism and infections. As a result, the entire region undergoes swelling and inflammation that leads to neck lumps. Graves' disease: Graves' disease is an autoimmune disorder caused by excessive thyroid production. The symptoms include anxiety, hyperthyroidism associated symptoms like thyroid swelling, which usually spreads to the neck region. Thyroid cancer: It is a very serious condition, which may take years to develop. Thyroid cancer is characterized by uncontrolled growth of thyroid gland cells. Symptoms of thyroid cancer include pain, difficulty in swallowing and swelling around the neck and thyroid areas. Since lumps in neck are an indication of an underlying pathology, be it non-severe in nature such as mumps or something as severe as thyroid cancer, neck lumps cannot be taken lightly. A doctor should be consulted if any swelling or persistent nodules are observed.